Football has helmets. Basketball has shorts. Baseball has hats and gloves. Hockey has sticks and skates. Running, however, is all about the shoes. Sure, it is important to get equipped with the right technical shirts, tights, pants, and jackets. In the winter, you want to make sure you have a hat, maybe some ear warmers, and definitely a good pair of gloves. Running, however, is the one sport where the primary focus needs to be on the shoes! Your feet take a beating while running. Step after step, mile after mile, your feet are carrying you to new places and new heights that you never before thought possible. They have carried you across fields, down wooded trails, across busy intersections and round and round in circles on the local high school track. Running brings you joy. Your feet allow you to run. Don’t you think you should pamper them? Running shoes come in all shapes, sizes, and colors. From minimalist to stability, there is a type of shoe for every type of runner…even those who like to give each toe its own private space. Shoes can be pure black, pure white, or a plethora of colors in between. Some are built for the city; others, the great outdoors. Throughout life, just like relationships, you will have good pairs and bad pairs, until you finally find that one perfect brand and style that you just absolutely love (until, of course, they discontinue that line…and the search starts all over again). 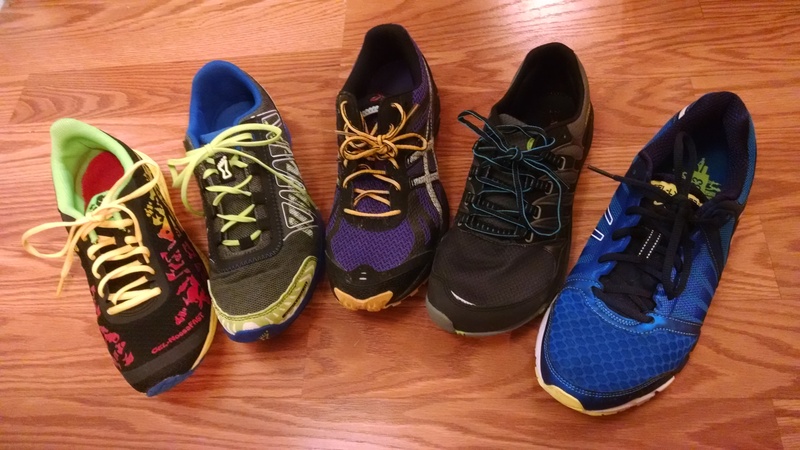 I have been blessed over the years to be able to try a wide range of running shoes. I started with the Nike Air Pegasus back in high school. I ran with that shoe for years until recurring injuries proved that, like a wizard trying to use another’s wand, these shoes just were not for me. I have run in Asics, Brooks, Adidas, Skora and New Balance. I have run in track spikes, cross-country spikes, mid range shoes and stability shoes. I have run the gamut from white shoes to black shoes to my newest obsession with shoes that practically glow in the dark. Needless to say, I am slightly passionate about running shoes. Why should you share my passion? Just as running becomes an expression of who we are, running shoes are an even further extension of our personality. Black shoes may say I am conservative and responsible. White shoes can speak to our need for a fresh start. Neon blue or yellow shoes scream out “Look at me and watch out, I am coming for you!” Even the most introverted runner can share a little bit of themselves with the world through their running shoes. Just as running becomes an expression of who we are, running shoes are an even further extension of our personality. So the next time you are up for new shoes, really shop around. Maybe give your old standby a break for a season. Head to your local running store and get your feet and stride evaluated. Take your time looking at all the shoes, and if you find one you like but not in a color you like, just ask! You might just be able to order them in other styles online. Consider it a pampering session for you and your feet…because with all the miles you have run and will run, you deserve it. What are your favorite shoes to run in? What’s your style, plain or flashy? Share in the comments below! I think the most important thing is to get fitted for the proper shoes. Shoes have caused me several injuries from wearing the wrong pair, so the fitting is key!! And don’t fall into the trap of what is trendy or “cute”, it doesn’t mean they are good for you! So true! Even you invest no other time or money in your running gear, taking the time to get properly fitted is key to success for both beginners and veterans alike! It is definitely worth it to go to a running store and have your gait analyzed, especially if you’re new to running. Running doesn’t come easily to a lot of people, so adding sore feet to the mix might be the barrier that prevents one from ever really getting started. Very true! If it hurts from the beginning you are likely not going to stick with it! Plus I don’t know about you but I love hanging out in running stores! It’s like Toys R Us, but for runners! I transitioned to zero-drop a few years ago and have been loving SKORA shoes. I can’t decide between plain or flashy though so I typically keep a flashy pair to run in and a plain pair to wear casually! The nice thing is having the options to choose between more minimal models or a pair with a little cushion. I started in Brooks Adrenaline GTS and ran in them for years. Over the last few years, I’ve switched to a lower drop. I’ve tried Inov8, Asics, Brooks, and Merrell. I find Asics to be the best fit for me. The Noosafast are my current standby and I like the flashy colors. For the snow, I’ll switch to my FujiRacers for more traction. I personally like to find shoes on sale and if I like the style and they have similar drop and characteristics to the Noosafast, I’ll give them a try. Some work, some don’t, so I end up donating some of them. I’ll have to post a picture of my current collection. Hey Ben! I just enabled image uploads for comments so I can’t wait to see them! Asics Gel Noosafast – Love the style. Just the right amount of cushion and drop for me. I sue them for training and races. Inov8 Road Extreme 208 – Got these on a super sale. Very little coushioning and a large toe box. I use these for shorter runs. Asics Gel Fuji Racer – These are my winter running shoes. Better traction in the snow. Call me crazy, but I love the purple. Merrell All Out Fuse – Got these on sale and thought I could use them for winter running as the drop is similar to the Noosafasts. Either the arch support is too high or the middle of the shoe is too narrow for my foot, but they aren’t great for me. Asics Gel Excel 33-2 – I bought these for the look. They aren’t great for me and I’m not exactly sure why. I can’t put my finger on it. I really want to like running in them. Altras and Skoras for me. The transition to zero drop was tough and not without its pitfalls, but I love running in zero drop shoes. I have a good mix between the two brands right now. After fighting IT band issues for a couple of years with some high end shoes that were supposed to be the answer, I don’t think I will ever go back to anything but zero drop as the change in shoes and running style has corrected the issue. I started running on some cheap shoes and was in pain but was thinking I would just push through it. When I upgraded my shoes my overall time and distance improved and I felt so much better after my runs. It truely is all about the shoes. I run in Mizuno Wave Riders. I have a pair of flashy pink ones and a plain pair of white clean ones. Just depends on my mood which ones I run in. Variety IS the spice of life! As long as they are both the right type of shoes for your feet, you can never have too many! I’ve tried all sorts of running shoes since I started training for the military. Lately, I’ve been in love with Altra’s shoes. What are your thoughts on this brand? I love the zero drop and wide toe box they offer. I don’t see others like it.